Learn how top performing wholesalers and distributors rely on technology in the new business environment by downloading this free report. Online sales, and new delivery channels, have changed customer demands and brought increased competition from organizations that can now serve new markets. Is your organization equipped to meet customer demands, without sacrificing profit margins? In today’s customer first world, there are many things manufacturing and distribution firms need to do. From new pathways to sales to ever-changing customer expectations and demands to the persistent threat coming from Amazon, those companies who can adapt and evolve will be best positioned for success in 2018 and beyond. This said, with the right planning, execution, and technology, organizations can gain a competitive edge—without sacrificing profit margins. 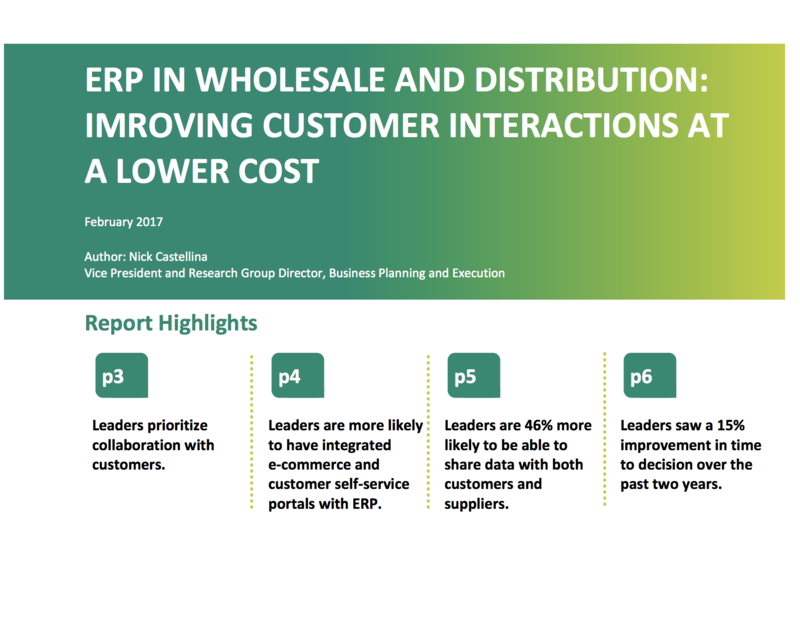 Leaders are more likely to have integrated e-commerce and customer self-service portals with ERP. Leaders are 46% more likely to be able to share data with both customers and suppliers. Leaders saw a 15% improvement in time to decision over the past two years.